"This French Canadian meat pie is hearty, satisfying, and easy to make so it's a great choice for a holiday main course. 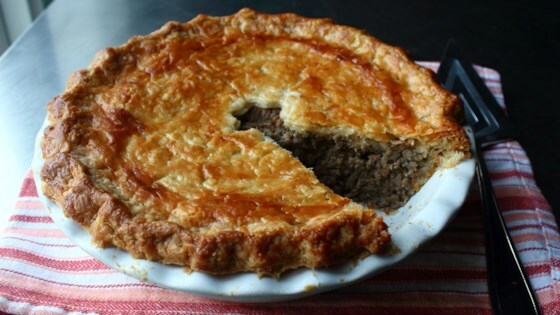 Visually impressive, relatively affordable, and best served at room temperature, so a tourtiere doesn't require any kind of precise timing." Place flour, salt, and frozen butter slices into the bowl of a food processor. Pulse on and off until butter is about the size of peas, about 30 seconds. Stir vinegar into cold water; drizzle water/vinegar into the flour mixture. Pulse on and off until mixture is crumbly and holds together when you pinch a piece off, about 10 seconds. If dough isn't pressing together, drizzle in another teaspoon of water. Transfer mixture to a work surface. Press it together until it becomes a lump of dough. Wrap in plastic wrap. Refrigerate until chilled, at least 1 hour. Mix salt, pepper, thyme, sage, cinnamon, ginger, nutmeg, allspice, mustard, clove, and cayenne together in a small bowl. Place potato quarters in a saucepan; cover with cold water. Add 1 teaspoon kosher salt. Bring to a boil over high heat; reduce heat. Simmer until cooked through, 10 to 15 minutes. Scoop out potatoes and transfer to a bowl; save cooking liquid. Mash potatoes with a potato masher. Melt butter in a skillet over medium heat. Add chopped onion and a pinch of salt. Cook and stir until onions turn golden, 10 to 15 minutes. Stir garlic, celery, and spice blend into the skillet with onions. Stir until onion mixture is evenly coated with the spices, about 30 seconds. Add ground beef and ground pork. Ladle about 3/4 cup of the potato cooking liquid into the skillet. Cook and stir until meat is browned and has a very fine, almost pastelike texture. Continue cooking, stirring occasionally, until meat is tender and most of the liquid has evaporated, about 45 minutes. Stir in mashed potatoes. Remove from heat and cool to room temperature. Divide chilled dough into 2 pieces, one just slightly larger than the other. Roll the larger piece out into a 12-inch circle on a lightly floured work surface. Place in a 9-inch deep dish pie plate. Roll top crust out into a circle about 11 inches in diameter. Cut small slits in the top crust to allow steam to escape. Fill bottom crust with the meat mixture; smooth out the surface. Whisk egg and water together to make egg wash. Brush edges of the bottom crust with egg wash. Place top crust on the pie and press lightly around the edges to seal. Trim excess dough from the crust. Crimp the edges of the crust. Brush entire surface of the pie with egg wash.
Place in preheated oven. Bake until well browned, about 1 hour. Let cool to almost room temperature before serving. Get ready for an incredible omelette experience! You can also easily tailor this to your own tastes, since other than the ground meat and mashed potato, pretty much anything goes. I may try this next time with beef gravy, as a few of my Canadian friends have suggested. Another suggestion was some ketchup which I tried on a cold slice, and it was delicious. Followed the recipe - far too salty. I will make it again, but adjust the salt. Delicious! I used pillsbury prerolled crust to save time. I grated one carrot into the meat mixture while cooking. Other than that I followed the recipe. Reminds me of my Nan’s. I used a mix of beef, pork and veal and to save some time I used pre-made crust. It was really good. My husband loved it!